Dachgeschoss Mana Kai Maui ETW am Strand mit Voll A / C. Wir haben beide Bäder total erneuert und auch einen neuen Raumteiler mit Schiebetür zusammen mit einer künstlerisch gestalteten Wohnung eingerichtet. Free High Speed ​​Internet. Atemberaubend, über den Palmen, Panoramablick auf das Meer zu den Inseln, unten gesamte Küste und bis zu Haleakala Volcano! Erstaunlich Walbeobachtung von unserem Lanai! Mana Kai Maui sitzt an einem Punkt an der Nordspitze von Keawakapu Strand. Keawakapu wird immer wieder als einer der besten Strände auf Maui gelesen und mit ein paar Schritten können Sie ihre Sand unter den Füßen spüren. Sie können entlang schlendern, eine Meile von diesem menschenleeren Sandstrand, und erleben Sie die beste Maui zu bieten hat. Die Mana Kai wird in Reiseführern als die schönste Ort mit dem besten Klima auf allen Maui geschrieben. Für sich selbst sehen, eine Google-Karte Satellit des Kihei Küste. Es wird Ihnen nicht erlauben, um den Klang der Wellen, die unsere Wohnung bietet hören, oder sitzen auf dem Wind Obergeschoss Lanai unsere gewiegt, aber das ist nur einen Klick entfernt. Die Mana Kai Resort absolvierte eine 5 Millionen Dollar renoviert, um den gesamten Komplex im Januar des Jahres 2008, und denen, die unsere einzigartige Lage abholen genau das zu bekommen. Du hast nicht die Chance auf die Gleichung, wo in der Mana Kai Sie sich befinden hinzuzufügen. Sie haben viel Zeit und Mühe, um nach Maui zu bekommen verbracht - stellen Sie sicher, lassen Sie sich das beste Sie finden können. Hier ist, was anderes kommt mit Ihrer Erfahrung. Schöne Einrichtung. Ursprüngliche Kunst von Maui vom Künstler-Besitzer, hideabed neue Königin im Wohnzimmer. Komplett renoviert und erweitert Küche. Feine erstklassigen Restaurant & Lounge im Erdgeschoss. Top of the Line Fein Deli, um 09.00 Uhr, Reisebüro, Schönheitssalon, beste Ort zum Schnorcheln zu öffnen. Wunderschöne Anlage, schöne Pool mit Wasserfall, samtigen Rasen berühren den Strand. Kein spektakulärer und romantischer Ort in der Welt als die des Mana Kai Maui! Es ist wirklich ein Paradies Lage, den Himmel auf Erden! Die Mana Kai sitzt auf dem südlichsten Teil von Kihei, und tatsächlich bezieht sich mehr auf Wailea Feeling. Was wir über Wailea haben, ist die Nähe zum Strand. Die meisten der Orte, um in Wailea in vielen Fällen zu bleiben auf dem Hügel, und in eine lange stapfen zum Wasser. Unsere 2. Schlafzimmer im Mana Kai Maui (auch entworfen, um als separate "Hotel-Einheit" mit eigenem Eingang und absolute Privatsphäre dienen) verfügt über eine Bar-Höhe Kühlschrank, Mikrowelle, High-Speed ​​Internetanschluss, einen kleinen Tisch mit 2 Stühlen, Klimaanlage, gespiegelt Schranktüren, Einbauschrank für Ihre Kaffeemaschine, Snacks, etc. Es ist neu mit einem schönen Panoramafenster mit Meerblick Nachschlagen der Küste in Richtung Lahaina umgebaut. Beide Schlafzimmer haben Kingsize-Betten, Bad mit Wanne und Dusche. Die Mana Kai Maui befindet sich im rechten Winkel zu den Rand des Wassers an einem Punkt, im Rückblick auf die gesamte Küste. Einer der großen Vorteile der Einstellung der Mana Kai ist, dass unserem Lanai (Balkon) ist im Windschatten des Windes. Es ist eines dieser scheinbar kleine Details, die große in ultimativen Genuss das Urlauber Webstühle. Eine Veranda mit Blick in den Wind wird viel weniger angenehm oder ausgenutzt werden. Gehen Sie die herrlichen Sandstrand bis zu den neuesten und spektakulärsten Hotels auf Maui. Nahe an den Geschäften, Märkten (innerhalb einer Meile) Golf, Tennis, und allen Annehmlichkeiten, wenn Sie nach Maui kommen, die Sie wollen. Ihren Urlaub im Mana Kai Maui wird unvergesslich für ein ganzes Leben sein! Der Aufenthalt in unserem privaten Dachgeschoss Wohnung wird sicherstellen, dass! Aloha! Pool, Bettwäsche, Strandtücher, Spectacular Dachgeschoss view - 2 Meilen von menschenleeren Sandstrand, New Glasplatte Herd, neuen Kühlschrank, neue Vorhänge, neue Esszimmer-Set, Besitzer sind stolz auf aktualisieren ständig die Wohnung, in der ein Schlafzimmer Einheit, Schiebetüren Shoji-Bildschirm trennen das Wohnzimmer und Schlafzimmer, normalerweise offen gelassen während des Tages, um den Panoramablick zu maximieren. Neue Gasgrills auf dem Gelände. Eine beliebte und willkommene Ergänzung. I have stayed at the Mana Kai twice now and really appreciate much about it. The location and vibe of the place is great. The person we dealt with (a family member of the owner I believe) was reponsive when we booked. When the lock broke, he had a locksmith there to address the situation immediately. Much appreciated. Beds are good (important). I also think that the owner could spend just a little bit of the rather steep nightly fare to make it a better situation for renters. Buy some more kitchen utensils, etc. Provide a cheap cooler. Buy some beach chairs for your guests to use. The Mana Kai provides chairs, but for use on their lawn only. What about when you want to sit in the sand or visit another beach? I just don't think that guests should be expected to buy their own. None of this was a big deal and overall it was a good rental experience. I would rent from them again. I just think, considering the nightly cost, that they could spend a couple hundred bucks now and then and make things better. My family and I have stayed in 809 numerous times. It has become our home on Maui. I love sitting on the lanai watching the whales. Falling asleep at night to the sound of the waves is such a peaceful experience. We look forward to our next stay. Great location, great view, beautiful building but unit could use some updating. Beautiful building and views but overall this unit is dated and because of this it was not as enjoyable as a previous stay in a different unit. Simple replacement of bedding, linens, paint, dinnerware and the stove would go a long way. The unit could also use new flooring and mattresses and it would be significantly more enjoyable. Air conditioning was nice and kept us comfortable. I am sorry you had some problems with our unit. This is the first non 5 star review we have received since our total remodeling of both bathrooms and installation of a custom high end sliding bamboo wall. We rent at over 90% occupancy, and a lot of our renters are repeat. I'll address your complaints down the response, but I need to add a few things about why our unit is unique and fair priced. I do not think there is another top floor unit, as reasonably priced as ours. If so I would love to know. When you rent ours - you know exactly where you will be located. The much more expensive units from the Mana Kai rental pool do not offer that assurance. Staying right above the restaurant can be an unpleasant surprise. Over view is is second to none, and the ambient visitor noise and footsteps above are non-existent. We are one of the few units that do not have to follow the same exacting remolding plans the rest of the units at the Mana Kai must abide by. This is a unit owned by a family of artists and musicians, and we have remodeled in a way that suits our taste. We call it relaxing and comfortable. We a use smaller fridge and stove to give more counter space, and to add room for a make up room connected to the main bathroom. The floor tiles are our choice over the large slabs that all the remodeled units must use. The painting is something our cleaning crew leader (the same person we have used for over a decade) will look into. We added the custom bamboo sliding wall to take care of chips that happened to the old painted one. Since we repainted everything during the remodel, and we have not had any complaints, I am glad you brought that up. We always attempt to resolve all problems immediately. With our unit use being over 90%, we add new linens more than a half dozen times a year. This is the first mattress complaint we have had, and we will also look into this right away. Like any rental spot, were are not the right fit for everyone. 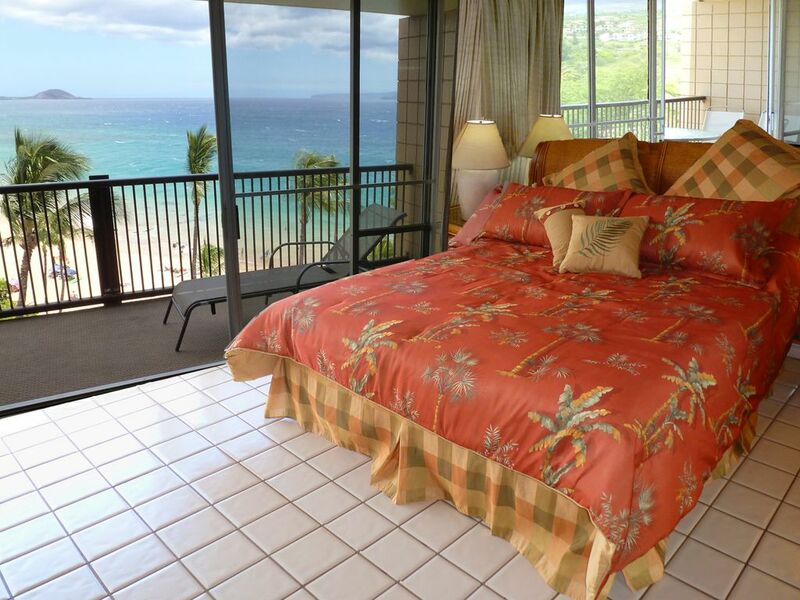 What we provide is great experience for those who want an unforgettable lanai view, and less humid breezes our non restricted high location provides. It is what we choose to provide, but will also problem solve anything that arises as soon as possible. Fantastic location and comfortable, clean property. The hosts were super-helpful with restaurant and activity recomendations. The snorkeling right off the property's beach was fabulous. The shaded palm grove out front was a gift in the midday sun and the pool was the perfect temperature, clean, and fun. The ocean was perfect and not too chilly, even in December. We slept with the deck doors open all night and listened to the surf. Haven't slept that well in months. We are a family with two teenagers and we all stayed comfortably at this property and had plenty of things to do for everyone. Can't wait to return and enjoy the Maui life again. Mana Kai 809 ... Paradise on earth! This was our 4th time staying at Mana Kai, and our 2nd in a row in 809. We love it! ... the sounds of the waves at night.. and such quick and ready access to the reef - with turtles almost everytime we snorkeled! The unit itself has every comfort and amenity we needed. New bathroom renos are fantastic. The bed is very comfy, as is the sofa. We barely used the A/C, as the breezes blow through so nicely. Fantastic views and sunset, either from the lanai or the lawn. As a property, Mana Kai is very well maintained, with a great restaurant on the main floor, a convenience store, and a sports rental shop. In the immediate neighbourhood, we also enjoyed walking on the beach, grocery stores, great restaurants - from Andaz brunch to Coconuts, to food trucks. Greg and family are great hosts - clear, honest, trustworthy, great communication. You will enjoy, and will be in excellent hands! This condo and its location are the best we have ever stayed in Maui. The condo with the new bathrooms and kitchen are absolutely stunning. The view from the lanai is breathtaking yet peaceful. We particularly enjoyed being able to swim, snorkel, boogey board and kayak at the beach right next to the condo. Between the condo and the beach - we never wanted to leave. The owners were a joy to work with and were very attentive to any questions we had. Bottom line - if you are going to Kihei/Wailea you are doing yourself a disservice if you don't stay at Mana Kai 809. Gehobenes Restaurant Top of the line Deli, Sushi-Bar, Happy Hour, Wassersportgeschäft, Tiki Fackeln besten Schnorcheln & Best location !! !